24/24: Call now The Beautiful Beach Awaits. If this one is booked (because it often gets booked up really quickly) we have another sister property similar to this one, also with many great upgrades. See our "Windancer 6" property on our website. Please note: because these bunks are built-in they are shorter than normal bunks. Adults or adult-size children cannot fit in these beds and we do not have a sofa-sleeper (and sorry we no not like people sleeping on our sofa). Be sure to check our calendars because they are always up-to-date, if this one is booked, we do have 2 others Coral Reef Club. 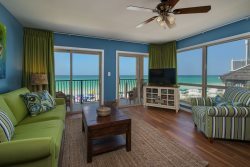 We also have one in Emerald Dunes, which is only 3 doors down from Coral Reef Club.